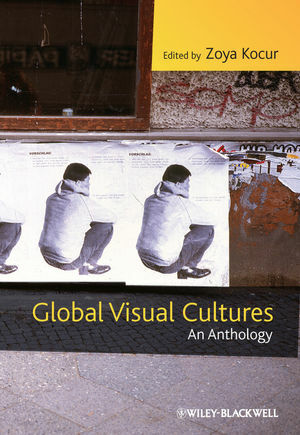 Global Visual Cultures is a definitive anthology that provides a new and groundbreaking perspective on the field, and addresses multiple interpretations of the visual, from considerations of the "everyday" to global political contexts. Zoya Kocur is an independent scholar based in New York. She has taught at New York University and the Rhode Island School of Design. She is the former Associate Curator of Education at the New Museum of Contemporary Art, co-editor of the volume Contemporary Art and Multicultural Education, and co-editor of Theory in Contemporary Art Since 1985 (2005 Wiley-Blackwell). Part I: Realigned Art Worlds: art/agency/globalism. 1.Globalism or Nationalism? (Cai Guoqiang, Zhang Huan, and Xu Bing in New York, Xiaoping Lin). 2. Linking Theory, Politics and Art (Marina Gržinić). 3. Art, Agency and Hermetic Imagination (Jean Fisher). 4. Constitutive Effects: The Techniques of the Curator (Simon Sheikh). 5. Do Images Have a Gender? (David Joselit). 6. Rethinking the F Word: A Review of Activist Art on the Internet (Mary Flanagan and Suyin Looui). Part II: (in)Visible architectures: space/geopolitics/power. 7. La Lección Arquitectónica de Schwarzenegger (The Arquitectural Lesson of Arnold Schwarzenegger) (Cuauhtemoc Medina). 8. Checkpoints: The Split Sovereign and the One-Way Mirror (Eyal Weizman). 9. Black Tents (Çagla Hadimioglu). 10. Subterranean Modernities: The Spanish City and its Visual Underground (Juan F. Egea). 11. Visualizing Antarctica as a Place in Time (Kathryn Yusoff). 12. Images of Untranslatability in the US War on Terror (Rosalind C. Morris). 13. An Immense and Unexpected Field of Action: Webcams. Surveillance and everyday life (J. Macgregor Wise). Part III: Mediated Bodies: representation/circulation/self. 14. Michael Jackson, Television, and Post-Op Disasters (Macarena Gómez-Barris and Herman Gray). 15. Aliens and Indians: Science Fiction, Prophetic Photography and Near-Future Visions (Curtis Marez). 16. Orienting Orientalism, or How to Map Cyberspace (Wendy Hui Kyong-Chun). 17. Spatial "wRapping": A Speculation on Men's Hip-Hop Fashion (Scott L. Ruff). 18. Self Styling (Sarah Nuttall). 19. "Straight" Women, Queer Texts: Boy-Love Manga and the Rise of a Global Counterpublic (Andrea Wood). 20. Squatting Through Violence (Simon Leung). 21. Contemporary Documentary Film and "Archive Fever": History, the Fragment, the Joke (Jaimie Baron). 22. The mote in God's eye: 9/11, then and now (Jon Bird). 23. Caught by Images (Ernst van Alphen). 24. Political Literacy and Voice (Joy James).